I was caught by surprise when April 2018 Singapore Savings Bonds was over subscribed. One thing I concluded that it is not the Singapore Savings Bonds scheme that is not attractive, it was the low interest rates that were not attractive! 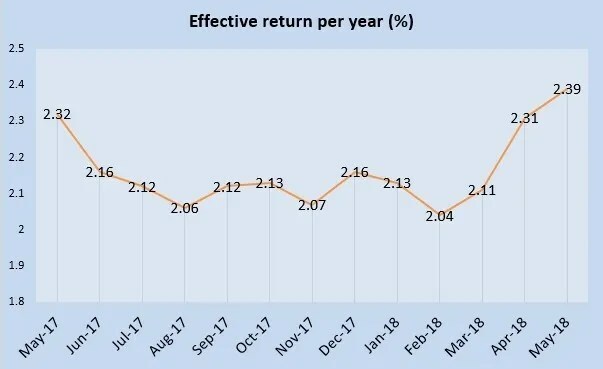 The effective interest rate for May 2018 Singapore Savings Bonds gives you an effective interest of 2.39% if you hold it for 10 years. That will be a total of S$2,416 of interests collected if you purchase S$10,000 of Singapore Savings Bonds now. This is higher than the effective interest rate of April 2018 Singapore Savings Bonds. If you see from the chart I plotted above, this is in fact the highest effective interest rate over the past 12 months. If you decided to apply for May 2018 Singapore Savings Bonds, there is some good news. The Monetary Authority of Singapore (MAS) announced that the monthly issuance size of the Singapore Savings Bond (SSB) programme will be increased from S$150 million to S$200 million from this month. According to MAS, this is in response to the increasing demand for Singapore Savings Bonds.